A Denver high school student was assigned to research a work of art by one of the masters and then reinterpret it for modern times. What emerged was a provocative image and a real-life lesson in the power of art. The image speaks to the nation’s painful history of slavery, racism and police brutality: A police officer, wearing a Ku Klux Klan hood, points a gun at a child of color, while in the background the Confederate battle flag overtakes the flag of the United States of America. It was hung inside a Denver municipal building as part of a display of student artwork, sparking backlash from police union officials who demanded Mayor Michael Hancock (D) take it down. The National Latino Police Officers Association called it “hate art,” and the Denver Police Protective Association called it a “horrible stereotype” that was suited for a private gallery but not a government building, according to the Denver Channel, the city’s ABC-TV affiliate. The city government and school system acknowledged the concerns in a statement Tuesday and said the artwork would be taken down. The student — who attends the city’s Kunsmiller Creative Arts Academy but has not been named — asked that the piece be removed “after learning of the negative impact of her work,” the statement said. We absolutely value the voices of our young artists, which is why we display their work every year. We also greatly respect the impact this art has had on our officers who serve and protect Denver and others in the community. But there is an opportunity here, too, to listen and learn from each other and to encourage our students to engage in difficult conversations. That is exactly the intention of DPS and the city as we continue to address the community’s concerns. Denver Chief of Police Robert White said that he was “greatly concerned about how this painting portrays the police” and looked forward to meeting with the student and her parents. That meeting occurred Friday. Afterward, White said that the episode had taught him how much more work the police department has to do in order to build stronger relationships with the community, according to the Denver Post. Hancock, who also attended the meeting, said that the student had meant to comment not just on the national debate about police and their relationship with the communities that they work in, but also on Denver’s history with the KKK. 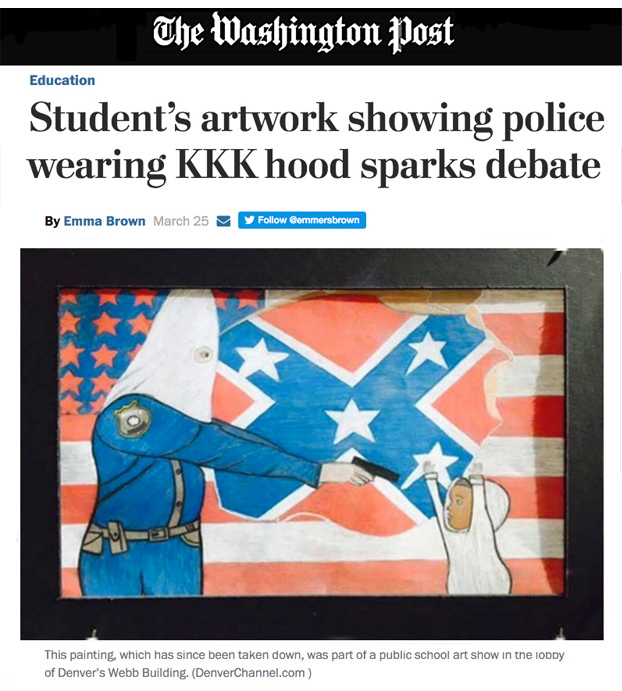 The student’s work was based upon two older pieces of art, according to city and school officials: Francisco Goya’s “The Third of May 1808,” which depicts Spanish people resisting Napoleon’s army, and “A Tale of Two Hoodies,” which was created by Michael D’Antuono in 2014. D’Antuono’s piece shows a hooded police officer pointing a gun at a young black child, while the child reaches out to offer the cop a bag of Skittles — a reference to the killing of unarmed black teen Trayvon Martin in Florida in 2012, who was carrying Skittles when he was shot by volunteer neighborhood watchman George Zimmerman. D’Antuono said that the backlash against the student’s painting and the decision to allow it to be removed, missed the point of the art: “to shed light and spark debate over the problem of racism in the criminal justice system,” he told Westword, a Denver weekly.